I've been missing from this Board for a while due to family obligations and making more quilts than I know what to do with. I do read through some of the forums, but just haven't contributed lately. 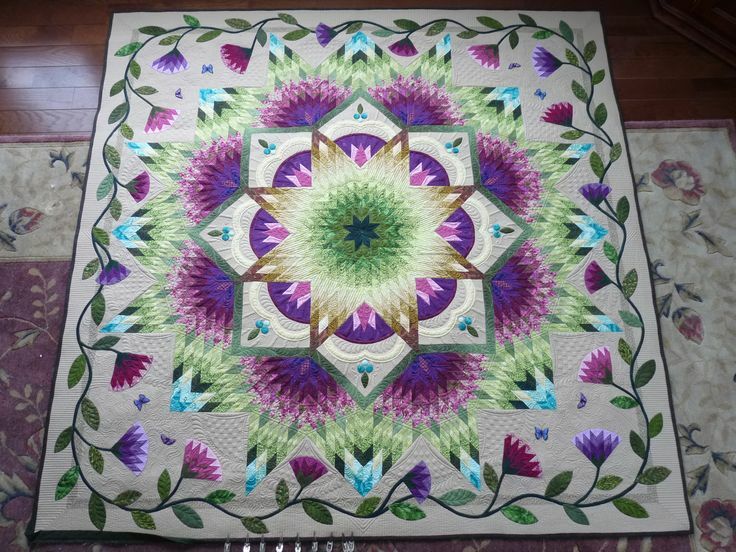 I am hoping that someone might recall seeing a star quilt (I believe it was a Carpenter's Star) a year or so ago (it might even have been in 2011) that looked like it was exploding from the center out. It was one of the most beautiful quilts I've ever seen and I recall showing it to my DH, so I know it exists. The problem is, I can't recall who made it or whether it was a Carpenter's Star at all. It may have been another pattern altogether, but it looked like it was blowing up from the center outward. I believe it went from a yellow center out to darker colors, but my ever worsening case of CRS kicks in and I'm not sure. If any of you remember the quilt or the person who made it, would you please let me know. I would like to make one similar to it as a Christmas gift and need to see how the colors were coordinated to make it look like that. If this is not what you want, try the Gallery and you'll see several different Carpenter's Star quilts and then can link to them. Also, there's the search function at the top of this page. Plus if you go back thru the threads there was one in the last few days where someone was looking for the CS pattern and many provided links. And too, if you posted to the particular thread you are thinking about, if you go back thru your previous posts, you can find it! Any chance it is this one? This pattern is from Jan Krentz's book "Lone Star Quilts and Beyond". Thanks, but that's not it either. I seem to recall that it was a Carpenter's Star pattern, but with the colors starting in the center and coming out and filling the entire pattern, making it look like it was a firework exploding from the center outward. Gosh, I wish I could find it. I looked at the Gallery and it's not there. I know I'm losing my mind in small increments, but this particular quilt I recall vividly because I thought I'd never be in a position to make it and I really wanted to. Now, with some experience behind me, I know I could do it, but I'd like to see it again for color purposes. Thanks for all your suggestions. Did you try the other suggestions that I gave you? Google images of Carpenter Star quilt and every variation of that name, like just carpenters star, carpenter star quilts (the plural), carpenter Star quilt pattern, etc. If you still can't find it after all that I would see if you can't download a line drawing of a carpenter star quilt and get out your crayons or colored pencils. Here are my results using "Carpenter Star Quilt"
Last edited by feline fanatic; 07-17-2013 at 04:45 AM. It's labeled as Zen Garden - but that seems to be a really popular quilt name. It has made the show circuit so if this is it, we should be able to get more info. When you find the right one, please post it! Is there a pattern for Zen Garden? Curious to see the picture of the one you are looking for as it sounds interesting. this quilt was made by Margaret Gunn of Mainely Quilts of Love an absolutely AMAZING LAQ. It is her own orginal design and just made the cover of Machine Quilting Unlimited along with an article telling all about this extremely talented lady. There is no pattern available. As far as I know she does not publish patterns of her original quilts of which she makes many for the show circuits. I sure hope that you can find it- it sounds amazing! Make sure you let us know if you find it and post a picture. It sounds amazing and I would love to see it. Are you looking for a Broken star? It starts with a Lone Star and then uses the same pieces to break out and get larger you can google Lone Star or Broken Star to see one. I think Eleanor Burns also has a book or teaches this one as well. Unfortunately, I have not been able to find it. I remember that someone on the board had posted it as a picture, but for the life of me, I cannot remember who or when. I really appreciate all the time and trouble you ladies have taken to help me. If I do locate the quilt, I will ask the owner for permission to repost the photo. I have taken all of the advice you have all given me, and looked for it under several different names, but no luck. I will keep trying. I am brand new so I am not very " savvy" at navigating yet BUT I saw the Carpenter Star quilt in the Picture section earlier this week. If you look in the Archive section of the Pictures you will find it listed as entry number 101 50th Anniversary Quilt. Perhaps you can get information from that member about the pattern. Hope this helps. The number of the listing changes when another picture is posted. Click on this site - I think this may be the one you are looking for.